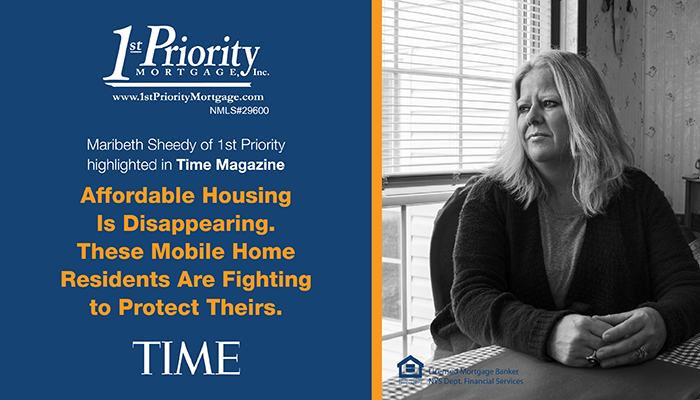 NEW YORK – 1st Priority Investor Relations Coordinator Maribeth Sheedy was featured in Time Magazine for leading the fight for affordable housing, and for her tireless efforts to protect the future of local mobile home residents. The Time Magazine article documents Sheedy’s efforts since Christmas last year, when Florida-based Sunrise Capital Investors became the new landlords of Akron Mobile Home Park in Akron, New York and proposed a rent increase of more than 40 percent. NMLS# 29600. Contact 1st Priority Mortgage, Inc. for mortgage products and eligibility. 1st Priority Mortgage, Inc. is a Licensed Mortgage Banker, New York State Department of Financial Services. All lending products are subject to credit and property approval. Terms, conditions, and certain restrictions may apply on all programs. Interest rate and program terms are subject to change without notice. This is not a commitment to lend. Contact a 1st Priority Mortgage Consultant for full details. (888) 500-9733.